Every year, dogs die from being left in hot cars. Many people don't realize how quickly a car can become dangerously hot. Even if left in the shade with the windows cracked, cars can become hot enough to cause heatstroke or death in the time it takes to run into a store. According to a study by San Francisco State University's Department of Geosciences, when the outside temperature is 30 degrees Celsius (86 Fahrenheit), a parked car's interior temperature can reach 45 degrees Celsius (113 Fahrenheit) in just 20 minutes. If we can raise awareness about the dangers of hot cars, fewer dogs will die this summer. 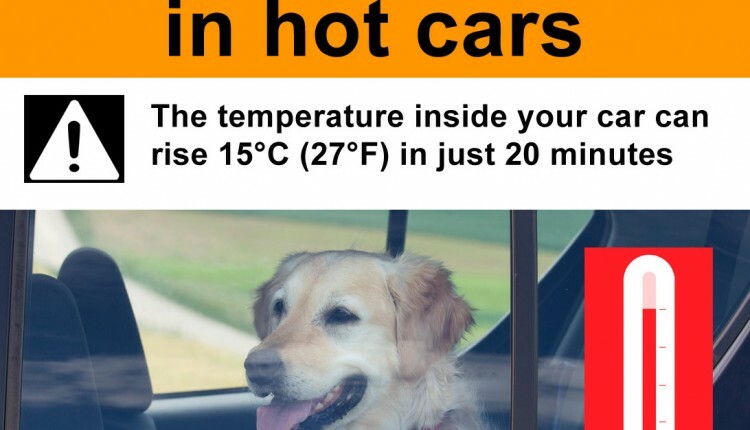 We ask store and mall managers to prominently display this Poster in numerous locations to remind/educate customers of the dangers of leaving their dogs in their cars during the warm summer months. We also ask that members of the public print copies of the Poster to take to malls and stores nearby and ask that the Posters be displayed. Click here to see a YouTube video of a British Columbia vet demonstrating this by measuring the temperature while sitting in a car for 30 minutes. Even with the window cracked, the dashboard gets up to 68 degrees Celsius! The Display Posters to Remind Dog Owners to Not Leave Their Dogs in Hot Cars petition to Managers of large stores and malls was written by Animal Advocates Society of BC and is in the category Animal Welfare at GoPetition.